Heleni of Très Petit Blanc is having a giveaway to celebrate reaching 200 followers. 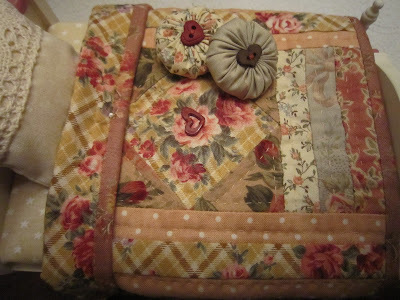 The beautiful miniature quilt and cushions pictured here can be yours! Just leave a comment on this post on her blog, and put a link to it on your own blog. The drawing will be April 16th. Thank you for the link Grace. 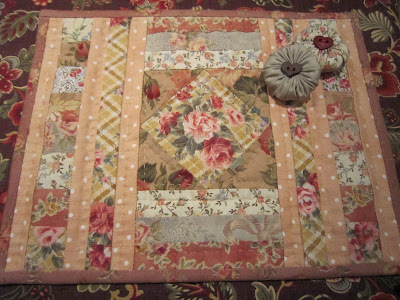 Her quilt is gorgeous. I came over because I read your comment on Marlie's post on following more than 300 blogs. I can't go beyond 300 as well using the usual Follower widget.I see you have the google widget on your blog. Will try to install it. Hi Sans! I'm not sure what the difference is between the regular Follower gadget and the Google one - I just added the one called "Followers" from the Blogger gadget list, under the Basics category. As far as following other blogs, like I said on Marlies's blog, I just click the gadget in the sidebar on blogs now rather than the Follow link at the top, and it's been working - it was only using the link at the top that I hit the 300 limit. Everyone seems to have the same Follower gadget. Let me know if you figure out a difference between them! I don't see any difference, Grace. By clicking the gadget on the sidebar, do you mean you click on the 2 squares that is on the top right hand corner of the follower widget? I can't post a picture in the comments, but check out this pic: http://www.treefeathers.com/blog/03-31follow.jpg - I marked where to click. I used to always click the "Follow" link at the top of blogs but it cut me off at 300. Ever since then I've just clicked the sidebar gadget instead, and it adds them to my dashboard with no problem. Grace, errrr , do you mean the ..hahahaha. I am only kidding You must have thought "this woman is so dense!" teehee. Anyway, thank you Grace,you could not have been any clearer with that pic. I am going to direct people to the link . I have always used the widget except once or twice but I got the 300 problem. So I had to delete some "dead" blogs from my list to follow new ones without creating another ID. I am now at 295. Will let you know if it works.